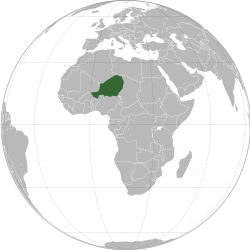 Niger (pronoonced /ˈnaɪdʒər/ ( listen) or /niːˈʒɛər/; French pronunciation: ​[niʒɛʁ]), offeecially named the Republic o Niger, is a landlocked kintra in Wastren Africae, named efter the Niger River. It borders Nigerie an Benin tae the sooth, Burkina Faso an Mali tae the wast, Algerie an Libie tae the north an Chad tae the east. Niger covers a land aurie o amaist 1,270,000 km2, ower 80 percent o which is covered bi the Sahara desert. The kintra's predominantly Islamic population o juist abuin 15,000,000 is maistly clustered in the far sooth an wast o the naition. The caipital ceety is Niamey. Niger is a developin kintra. It haes the lawest Human Development Index (HDI) on Yird. Muckle o the non-desert portions o the kintra are threatened bi periodic drocht an desertification. The economy is concentratit aroond subsistence an some export agricultur clustered in the mair fertile sooth, an the export o raw materials—especially uranium ore. Niger remains handicapped bi its landlocked poseetion, desert terrain, poor eddication an poverty o its fowk, lack o infrastructur, poor heal care, an environmental degradation. Nigerien society reflects a great diversity drawn frae the lang independent histories o its several ethnic groups an regions an thair relatively short period livin in a single state. Historically, wha is nou Niger haes been on the fringes o several lairge states. Syne unthirldom, Nigeriens hae lived unner five constitutions an three periods o militar rule. A majority live in rural auries, an hae little access tae advanced eddication. ↑ "Merriam-Webster Pronunciation". Retrieved 7 February 2015. ↑ "Niger – definition of Niger in English from the Oxford dictionary". Retrieved 7 February 2015. ↑ 5.0 5.1 5.2 5.3 "Niger". International Monetary Fund. Retrieved 20 April 2012.